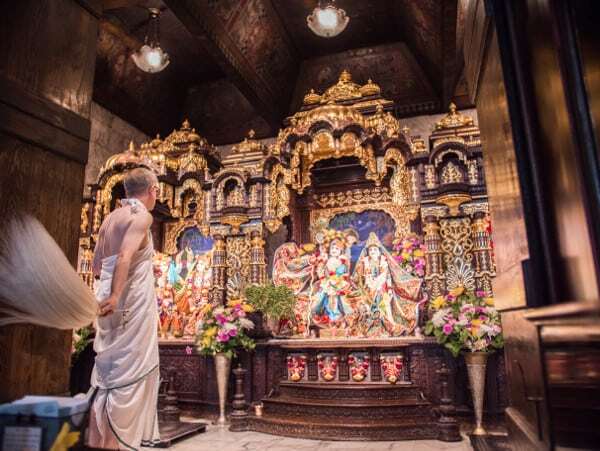 His Divine Grace A. C. Bhaktivedanta Swami Prabhupāda chose 1966 as the right moment to found The International Society of Krishna Consciousness (ISKCON) in New York City, bringing the teachings of ancient Hindu spirituality to the West. 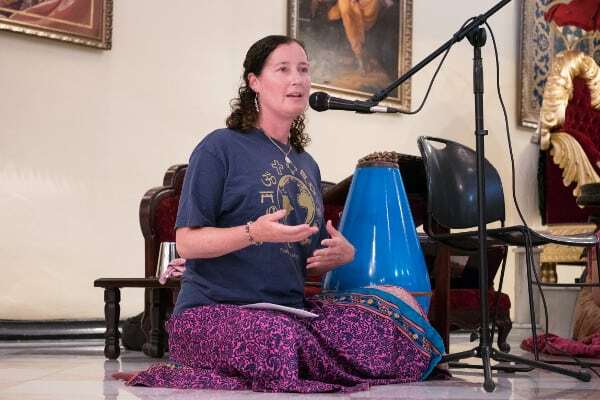 ISKCON, also known as the Hare Krishna Movement, was part of an enormous shifting of consciousness that took place in the American psyche in the 20th Century. Please see “American Veda: How Indian Spirituality changed the West with Dr. Phil Goldberg In the time of hippies, free love, Vietnam, yoga, drugs, meditation and cults, the Hare Krishna Movement with its long-haired youth chanting in airports and on street corners quickly became dismissed as a cult. What was lost to many was the richness of an important spiritual tradition. 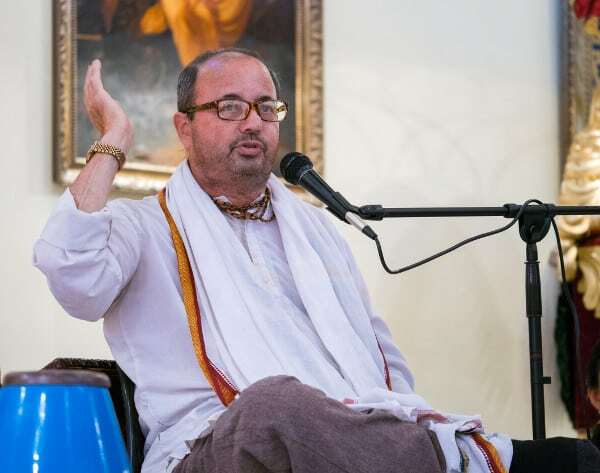 The monotheistic Gaudiya-Vaishnava tradition is based in the Vedic teachings of The Bhagavad-gita and goes back over 5,000 years to the very roots of Hinduism. Rev. 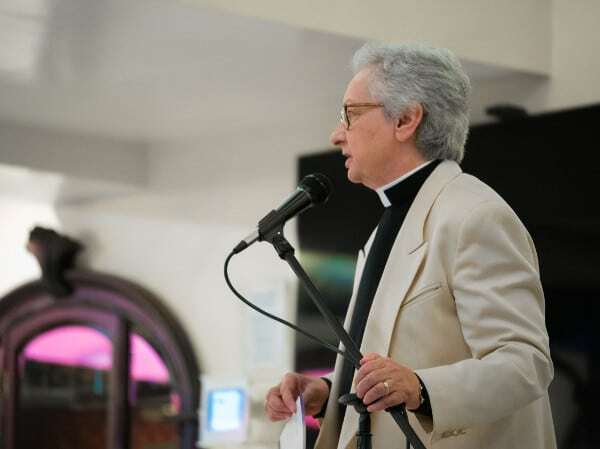 Dr. Gwynne Guibord has long wanted to invite people to take a deeper look at this faith that is still practiced by millions of people throughout the world. 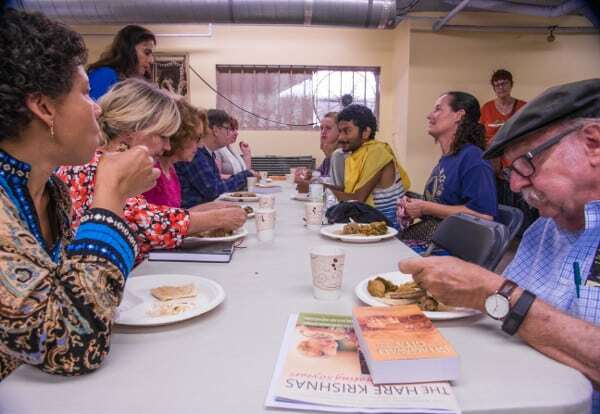 Sura Das, a member of The Guibord Center Advisory Council, agreed and provided this time to us to experience ISKCON first-hand. Shoes and the trappings of daily life are set outside the door. We enter into a quiet space of polished marble floor and white walls where worship takes place six times a day. A long wooden screen sits closed atop the raised altar space. We are early. One’s eye is caught by the man seated on a chair high off the floor in the far corner. He is wearing a wreath of flowers and remains motionless in a perfect posture of peaceful contemplation. 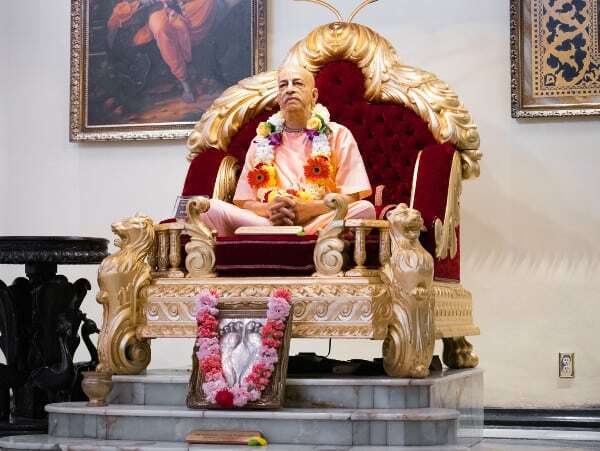 It takes a few moments to realize that he is a skillfully-created statue of the founder of ISKCON. I laugh to myself gently. My gaze is pulled upward to an enormous winged bird-like figure perched near the ceiling. This is Garuda, the mount for Lord Krishna, who allow Lord Krishna to be everywhere simultaneously. 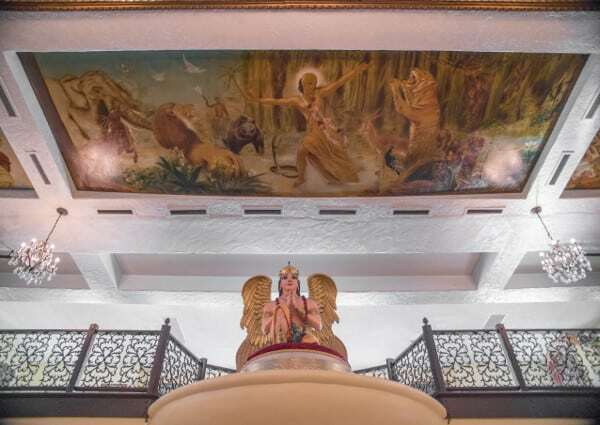 In front of the Garuda on the ceiling is a large painting of Krishna, standing in a circle of wild animals. Krishna is the protector of all animals. They are friends, allies, members of one Creation. 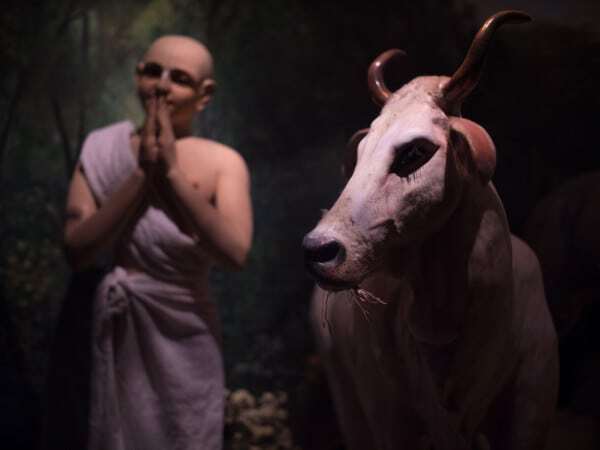 Devotees of ISKCON are serious vegetarians. They do not eat animals, fish or eggs. They run vegetarian restaurants and feeding programs throughout the world which affirm their respect for the dignity of all sentient beings. We will enjoy a vegetarian meal with our hosts following our time together here. 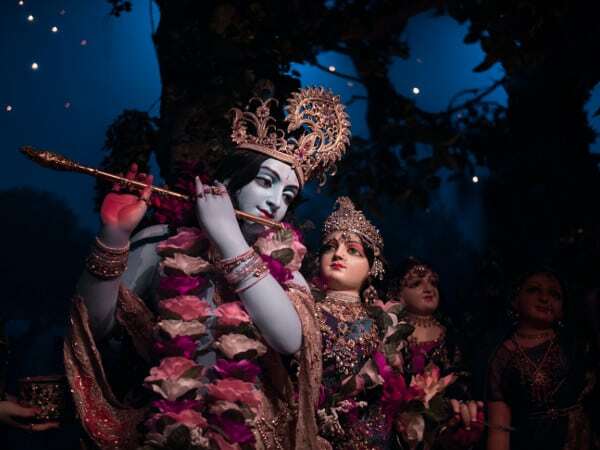 A special Bhagavad Gita Diorama-Museum is part of this particular temple, including 11 life-sized scenes from the Bhagavad-Gita, recreated to illustrate basic tenets of ISKCON. Tours of the museum are offered to all. Sura Das begins the presentation: “The Gaudiya-Vaishnava goes back 5,000 years. It is monotheistic. There is one god. His name is Krishna. He goes by many names: Krishna, Allah, Yahweh, Jehovah, Govinda, Christ. One God. Many names.” Sura uses the example of the many names he is called by: father, son, husband, colleague, friend, ex-husband. Many names and yet, he is always himself. One God. Many names. There is one God. These phrases are repeated over and over again. The repetition becomes a loose chant. He shares the story of wondering where the spiritual practices he engaged in as a youth came from. 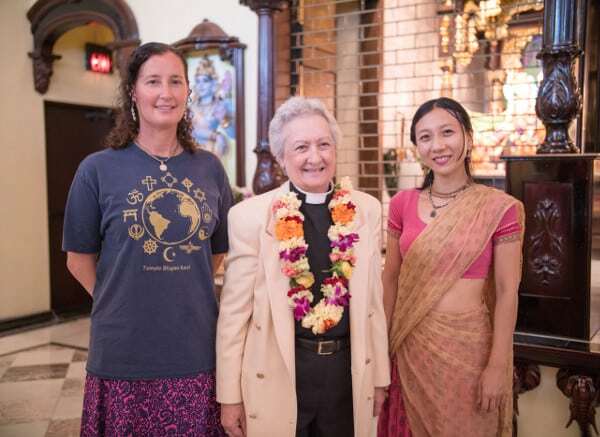 Overtime he began asking visitors to his father’s home where their spiritual practices came from – the answer was always the same – the Vaishnava tradition. This is orthodox Hinduism coming from the teachings of the Bhagavad-gita. There are many types of Hinduism, he explains, just as there are many types of Christianity and Judaism and Buddhism. The ancient traditions articulate the great questions: Who am I? Who is God? What is the relationship between us? Why is there suffering? He then makes a distinction: Hare Krishnas do not believe that we are all One in the sense that we will become like God. No. God is God and we are human. Our job is to worship God not to seek to become One with God. Sura’s colleague spends a few minutes addressing how to practice these ancient teachings in our daily lives by choosing to constantly remember God in every thought and action. Live your regular life conscious of God and of being in God’s service. 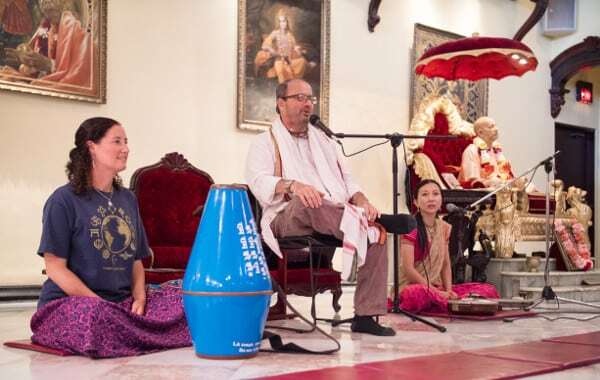 The worship finally begins with the Kirtan, the chanting and singing that clears the mind resetting our vibration to bring joy and purity in worship of Krishna. (God). The wooden barrier is finally lifted to reveal the joyful figures of Krishna and his beautiful companion, Radharani. We are refreshed. We leave with more respect for this practice that touches the hearts of millions and has touched ours as well. I go home a better follower of my own faith because of the generosity and loving kindness I have witnessed at ISKCON.